Newland's pedestal supported work surfaces create a dramatic "floating top" appearance for a distinctive, contemporary office setting. From executive suites to corporate boardrooms, Newland components are easy to specify. Simply choose work surface shapes and support. Pedestals or tapered legs, and optional modesty panels and storage components. Extended credenzas can be created by placing multiple components side-by-side with a single floating top. Hutches, bookcases, lateral files, wardrobe and storage cabinets and personal towers accommodate additional office organization. 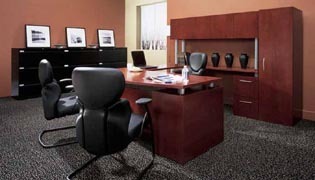 Newland, with it's elegant details and sophisticated style creates a prestigious office environment. Pedestal supported worksurfaces offer a dramatic "floating top" appearance that is distinctly unique. Whether arranging an executive suite or boardroom, Newland is easy to specify. Select the shape of your worksurface, the type of support (either pedestals or tapered legs), the color of posts (silver or black), and storage unit. Pedestals feature box-box-file or file-file drawer configurations. Modular two high lateralfiles, mixed storage and storage cabinets may be placed side-by-side with a rectangular top to create a beautiful "floating top" credenza. A variety of storage components are available, including hutches, bookcases, wardrobe cabinets and personal towers. Hutches feature four monoposts (sliver or black) to attach a 72", 66" or 60" wide worksurface and offer optional back panels available in either fabric or veneer. Round or racetrack tops, combined with sleek tapered legs available in silver or black create sophisticated boardroom and meeting tables. 1 3/16" thick floating top design. All edges feature 3mm solid wood edge banding. 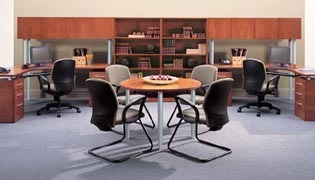 Workspaces are created by selecting tops, pedestals, legs and modesty panels. Worksurface tops include bow fronts, extended corners, "D" islands and "P" islands. Tops may be supported by tapered legs. Tops may also be supported by pedestals or 2-high lateral file/storage cabinets that feature 2" round black or silver posts to create a dramatic "floating top" appearance. All pedestals are full to floor and locking. Pedestals feature Waterloo™ suspensions and five-sided drawers. All drawers are standard in vinyl-wrapped construction with black drawer sides and bottom. Locks are standard on pedestal and storage components. On units that feature two box drawers and one file drawer, the file drawer and lower box drawer are locking. Hutches feature four decorative coordinating 2" round black or silver posts that attach to the worksurface. 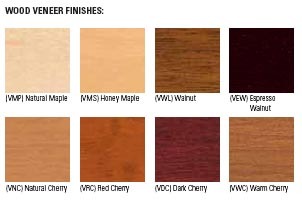 Available with fabric or veneer back panels. Round and racetrack tops are available. Combine with tapered legs to create sophisticated boardrooms. All components are shipped assembled, unless otherwise noted. Hutch supported by metal posts available in silver or black. Filing and Storage lateral files and storage cabinets can be combined to create a decorative storage credenza. Hanging file rails available for letter or legal filing. Full extension with steel ball-bearing progressive slides. Metal worksurface supports create a dramatic floating top appearance. Available in silver or black. Layout of top image. Total List Price of Desk Unit $11,003. Credenza List Price $3,702.